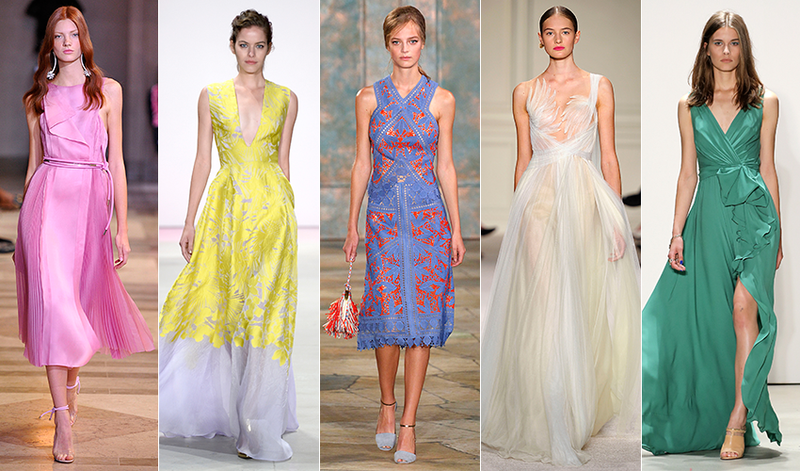 The spring shows of New York Fashion Week are always the most dazzling, with florals and lace, vibrant neons and pretty pastels, and a whole lot of white. And while the fall shows may have that eternal elegance in deep dark colors, we're definitely partial to the lightness and airiness of the spring collections. From British favorite Jenny Packham to the always show-stopping Marchesa, this season's collections were as memorable as ever. It's an understatement to say that it's difficult to choose the most beautiful of the entire week! If there's anything you take away from this September's NYFW, look through the below for a serious dose of pretty. They're the gowns we're sure will be all over the red carpet next spring -- and possibly even before that. (Celebs are famous for not wanting to wait until the proper season, snatching dresses off the runway almost immediately.) So we're taking bets, which do you think we'll see on the Emmys red carpet this weekend? Click through below to see them all, and let us know in the comments.